The Areca Palm, scientific name Dypsis lutescens (synonym: Chrysalidocarpus Lutescens) is a beautiful palm tree from Madagascar. This plant is also known as Butterfly Palm, Yellow Palm, Golden Cane Palm, Madagascar palm and Areca Lutescens. It is a common ornamental in subtropical and tropical regions around the world. Probably it is the most cultivated nursery palm tree. However, it is endangered and very rare in its natural habitat Madagascar. The Areca palm is a low maintenance plant and a fast grower. You can grow this exotic plant as a house plant. It will bring a tropical touch into your home and purify the air. 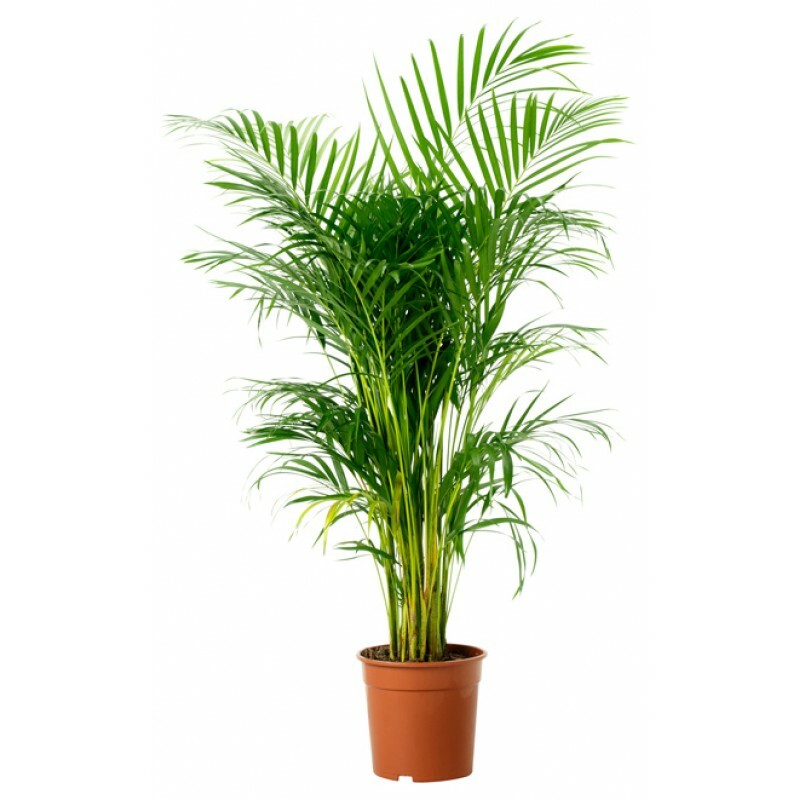 The Areca is consistently rated among the best houseplants for removing all indoor air toxins. The graceful Areca Palm tends to grow in clumps. The adult plant looks like a large bush that can reach 20 feet or more in height with a spread of 5-10 feet. As a houseplant it is usually grown much smaller. Plant's height with pot approximatily 2 feet and pot size is 5 inches. plant can survive indoor and outdoor condition. plant is usefull for air purifying, home decor, garden decor and gift purpose. English Ivy Plant Ivy is a common houseplant, which somewhat belies the fact that it’s not particularly easy to grow indoors. They don’t much like artificially warmed, dry air, which describes most heated and air-conditioned homes today. Nevertheless, ivies continue to be seen throughout garden centers because of their beauty. Properly grown ivies make wonderful trailing plants, climbing plants, and even indoor topiaries. Growing Conditions Light: Bright light in summer, but n..
English Ivy Plant Ivy is a common houseplant, which somewhat belies the fact that it’s not particularly easy to grow indoors. They don’t much like artificially warmed, dry air, which describes most heated and air-conditioned homes today. Nevertheless, ivies continue to be seen throughout garden centers because of their beauty. Properly grown ivies make wonderful trailing plants, climbing plants, and even indoor topiaries. Growing Conditions Light: Bright light in summer, but not di..
Rhapis excelsa grows up to 4 m in height and 30 mm in diameter in multi-stemmed clumps with glossy, palmate evergreen leaves divided into broad, ribbed segments. Leaf segments are single or few in young plants and increase to a dozen or more in mature plants; segments are divided to the petiole. Leaf-ends are saw-toothed unlike most other palms, occurring on slender petioles ranging from 20 to 60 cm in length. New foliage emerges from a fibrous sheath which remains attached to the base. As the p..
Money Plants In every second household, you can find a money plant blooming in its glory. Money plant is considered as a lucky plant which brings wealth, health, prosperity and happiness in the house. Money plant is also known as Malabar Chestnut or saba nut. There are many facts about money plant that you must know. For example, money plant in Feng Shui is considered to be a lucky plant that brings monetary gain and good fortune. However, the money plant is also grown in the house as an indoor.. The Peace Lily is a striking plant when used in a massed display. They bloom in the spring with long-lasting flowers that hover gracefully over the leaves on thin stalks, although they can be forced to bloom in the fall or winter. A very well-grown Peace Lily may bloom twice a year, resulting in several months of flowers. All spathiphyllum are vulnerable to bugs including aphids, mites and scale, as well as root rot if they are allowed to sit in water. Curled, pale leaves generally indicate too ..